UPDATE: I am reposting this from six years back. 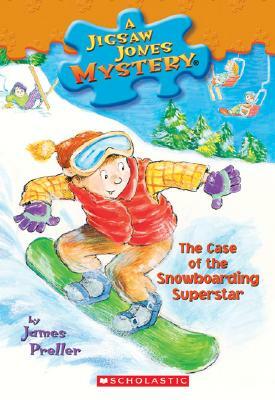 This book — like every Jigsaw Jones title — subsequently went out of print. Hard to find. I’m told that dedicated fans have success on eBay and Craig’s List. The good news is that Macmillan has contracted to bring eight classic titles back into circulation, beginning this August. I’ve also written a brand new mystery, The Case from Outer Space. And I’d gladly write another if anyone asks. 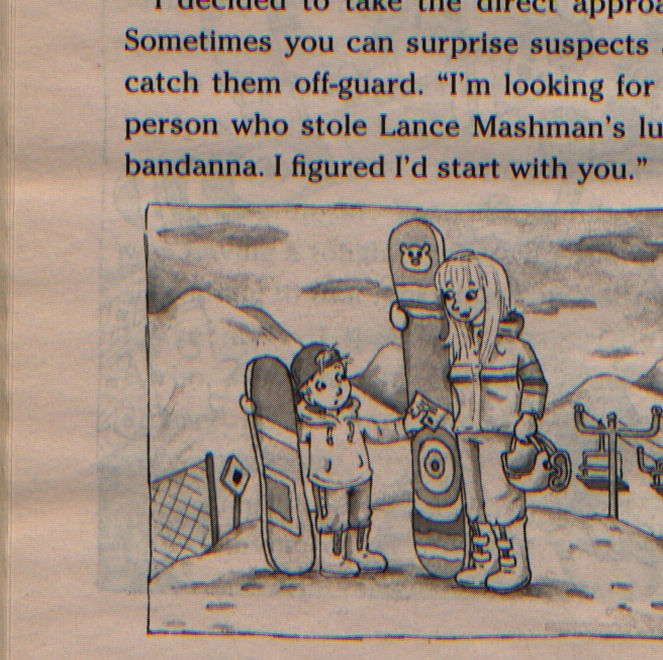 To date, there are no plans for Snowboarding Superstar. As part of a continuing (read: sporadic) series of posts, I take a look back at old Jigsaw Jones titles with the intention of providing my Nation of Readers with more “extra juicy” background info. If you are like me, you might gag at the thought of yet another writer describing his “creative process.” There is something oh-so-wearying about it. The phrase, “Don’t be a gasbag,” leaps to mind. But let’s see if I can pull this off without too much self-aggrandizement. The simple truth is that I am proud of this series and I sometimes (often?) wonder how much longer they’ll be around. I see this blog as document, as archive. Today’s title is seasonally appropriate, Jigsaw Jones #29: The Case of the Snowboarding Superstar. It begins with Jigsaw chatting with two of his brothers, Daniel and Nick, as they prepare for a family ski vacation. Some background: My father was a veteran of World War II, who returned home, got married, went to college on the G.I. Bill — a great investment by the Federal Government, by the way — and looked with my mother for a nice place to settle down and raise a family. Suburbia, preferably. He found a newly-built home in Wantagh, Long Island, designed after the Levittown model (for a fascinating history on that, click here). They bought a three-bedroom house for somewhere along the lines of $12,500. One problem: My parents kept having children. Seven in all. It got crowded. At one point when I was still quite young, my folks slept in the back bedroom, my two sisters (Barbara and Jean) shared a small room, three boys had the front room (John, Al, me), and my father turned the garage into a bedroom for the oldest boys (Neal and Bill). I have strong memories of those early childhood days, sharing that crowded room with two big and somewhat mysterious brothers. 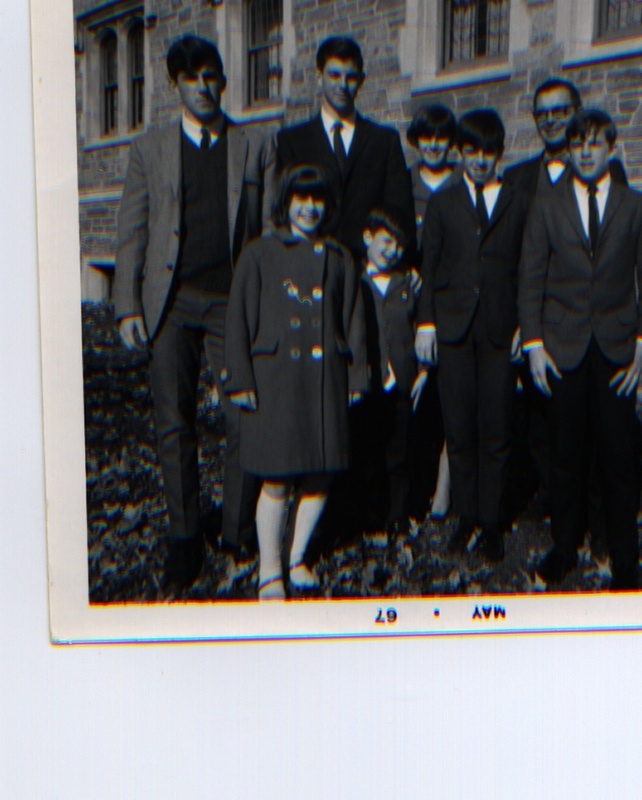 Below, here’s my whole family except for Mom, 1967. We always dressed that way! I shared a bedroom with the two goons on the right — don’t let the ties fool you. The dynamic in the book’s first chapter, with two older brothers schooling Jigsaw, springs directly from my sense of those times. I thought for a moment. “Dude,” I answered. “It’s the opposite of wack,” I explained. “Do you smell me?” I asked. * I loved the setup for the book, with Jigsaw away from Mila for the first time. It gave the book a different shape — and put Jigsaw in a tough situation. After all, this was #29 in the series, so I was eager to find new ways to keep it fresh. I know that some successful series, like The Magic Tree House, tend to follow a more rigid formula. And I understand the reasons why that’s appealing and reassuring for young readers. But it just wasn’t me. For better and for worse, I kept trying to mix things up. * Mila mentions to Jigsaw that she’s practicing for a piano recital. Her song will be “The Maple Leaf Rag.” This comes from my son, Gavin, who also played that song in a recital. * Grams and Billy are left behind to “mind the fort.” This expression, used by Mr. Jones, was something my father commonly said. I love his old verbal habits, the phrases he often used, and I try to keep them alive as best as I can — more than ever now that he’s gone. It’s a way of keeping that connection alive. I hear those phrases and think of Dad, all the more so when his words come out of my mouth. 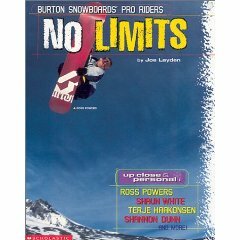 * I once edited a book on snowboarding, written by Joe Layden. I learned a lot about the sport in the process, so it was comfortable territory for me to explore in the context of a Jigsaw Jones mystery. Illustration by Jamie Smith — crudely scanned. “So you don’t care if you win?” I asked. “It sounds like you think Lance is annoying,” I commented. “You don’t like him?” I asked. Yes, I knew what Bubba was saying. “I heard that he fired you this morning,” I said. NOTE: I’ve been blogging at this site since May, 2008, which is like 120 in Blogger’s Years. My strong suspicion is that a lot of the oldies-but-goodies have not been seen by my current readership, so I decided to give this one a new airing. 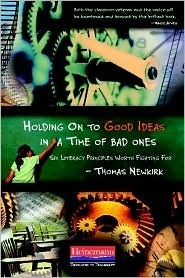 I still often think of Mr. Newkirk’s great book and insights. This was originally posted on March 6, 2011. 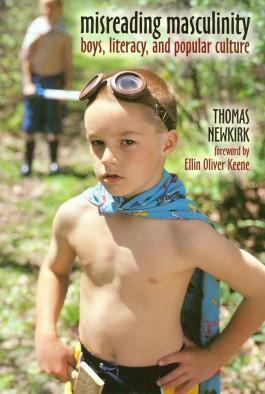 I recently read Thomas Newkirk’s outstanding book, Misreading Masculinity: Boys, Literacy, and Popular Culture. I sent him a complimentary email and, to my great surprise, he agreed to an interview. My reasons were selfish. I simply wanted to learn more from this very smart, insightful man. Back in college, I had an English teacher who taught me an important question: So what? I mean, okay, boys don’t read as much as girls. They do other things well. What’s the big deal? I think there are two responses. Reading well is so tied to school success — and to liking school — that it is unethical to write off a big percentage of boys as non-readers. It may have been possible in previous times to drop out or barely finish school and go on to good jobs. But that is not the case now. I think the bigger argument that reading is a deeply pleasurable and enlightening activity — or can be. I don’t want boys to miss out on it. One of the things I loved about your book was how you wove in small pieces of memoir, little stories from your life, and connected those experiences to the book’s larger themes. You tell a wonderful story about how as a young man you visited the library in Harvard. You saw a dusty old scholar with a suitcase full of index cards and suddenly recognized the absolute weirdness of the literary life. Silent, isolated, inactive –- and how utterly strange it must appear to a non-reader. As book lovers, I don’t think we fully appreciate the perspective of the non-reader, how foreign it must look to a boy who typically chooses action, companionship, and noise. Reading doesn’t have to be silent and isolated — although it must appear that way to readers who have never been in what Nancie Atwell calls “the reading zone.” When we enter that zone — identifying with characters, visualizing, hearing the voices of the narrator and characters — we are NOT alone. And if reading can be shared in friendship groups, talked about, it becomes even more social. C.S. Lewis once said that we read to learn that we are not alone, and I believe that. 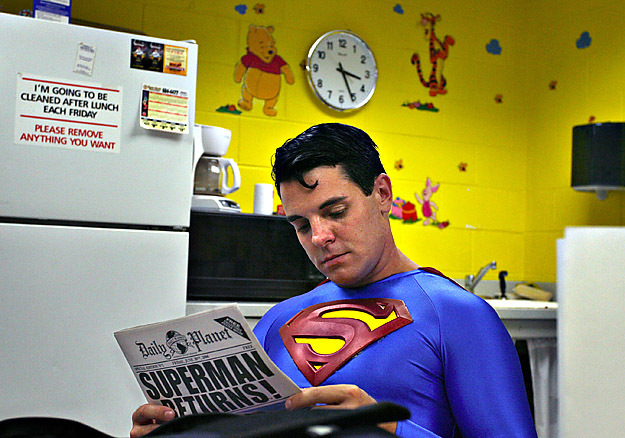 You made a funny comment, when exploring the tension between literacy and the code of the real boy: “What better disguise could there be for Superman than to turn him into a writer!” It’s just not a very masculine endeavor, is it, shutting one’s self away from the active world, isolated and alone, sitting in a chair in silence. How much more un-boy can you get? But I think technology is changing that. To compose with the resources of the Internet — to make digital stories, to navigate the various social networks, to create animation. We have recently seen how exploiting these social networks can bring down dictators. This is writing that is anything but isolated. Maybe school writing and reading is too isolated, but digital literacy is anything but. At one point, you note, “Boys often feel than an open show of enthusiasm for schoolwork, particularly in the language arts, can undermine their identity as a ‘real boy.’” It seems like boy culture –- the codes of behavior — can be a major obstacle for boy readers. Absolutely. I remember the African American journalist comment on the social pressure for African American boys to see trying at school as being “white.” His comment was: “With friends like that who needs enemies?” One reason parents look desperately for charter and private schools is to find places where trying and excelling at academics is part of the school culture. As an adult, I enjoy reading closely observed, realistic fiction. Life’s little moments. I love Richard Ford and nothing ever happens in his novels. It takes him twelve pages to go to the store to pick up some muffins. And that fits in perfectly with a classroom emphasis on memoir writing. But I can vividly recall that as a boy I wanted things to HAPPEN in my stories. Otherwise, why write about it? So I think when boys are pushed to write about, say, their trip to the beach, about real things, they are bored and disappointed. A bomb didn’t explode? A shark didn’t attack? Why bother writing about eating chicken salad sandwiches with Uncle Max? There has been a lot of the imposition of adult tastes on students — who may find fantasy and adventure genres more appealing. I don’t think that means that we give up on asking students to read and write realistic genres — but we need to be open to other tastes as well. Fantasy allows us to escape, to be bigger and braver than we are, to suspend the limitations of time and space. I think we all need that freedom as well. Yes, unfortunately, many schools have given up on making meaningful distinctions here. 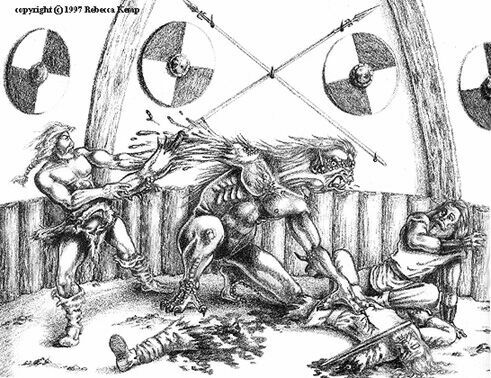 I have never understood, for example, why it is OK to read about violence, even the gruesome violence of Beowulf, and that’s ok, even culturally valued. But if a kid writes something like that, it’s off to the guidance counselor. For me the key question is this: does the writing seem threatening to anyone; does it make anyone feel unsafe or targeted. If is does, it fails to meet the basic rules of any school. But if a kid writes a Star Wars take-off and a space ship explodes, does anybody really feel threatened by that? I guess it’s natural for us, as enlightened adults, to want boys, or any students, to value what we value. We want them to read and appreciate what we consider to be good books. When those values aren’t shared –- when, say, they like low-brow stuff, AKA, “crap” –- the tendency is for us to see it as a deficiency in them. There’s something wrong with boys. I think we all like some AKA crap. No one is high brow all the time. 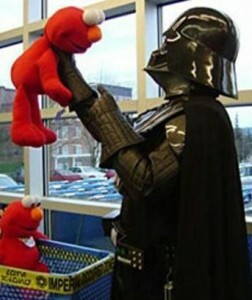 So it seems to me OK to ask kids to value what we value; but we also have to understand the appeal of what they like. It can’t be all one or the other. We have values and goals for their reading and writing; but we won’t win the cooperation of students if our attitude toward their culture is one of dismissal. Teaching is a cross-generational trade. 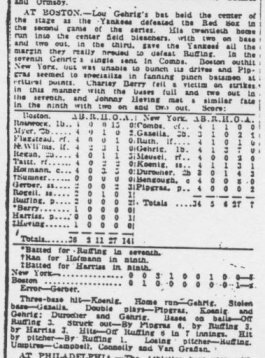 As a man who came to reading through my boyhood love of sports, where I’d dive into the morning paper (pre-ESPN, thank goodness) for the stats and scores and stories, I liked that you included a nod to “the literature of sports tables.” I can read a box score and imagine a half-dozen story lines. Yes, it’s so rich in information — the scores by quarters or innings. Who’s hot and who’s not. It is still my favorite page in the sports section. I am convinced that one advantage boys have in math is their early immersion in sports statistics. At times you use the term, “school literacy.” How do you distinguish that from ordinary literacy? Is it a matter of “school-approved” literacy? School literacy is necessarily a limited subset of possible literacies. It traditionally focuses on the verbal over the visual; on high culture over popular culture; on print over oral expression; on realism over fantasy and escapism; on extended formal writing over informal and expressive writing. It resonated with me when you gave a historical perspective on oral vs. silent reading, linking it to a “cult of efficiency.” We know that speed readers are taught to eliminate sub-vocalization, and instead to scan chunks of language, eliminating meaningless words. Yet as a writer, some of the best advice I can give is to read what you’ve written aloud, to really hear what you’ve written, the sound and rhythm of the words. That is, it’s the total opposite of what most of us do in silent, sustained reading! I am convinced that even when we read “silently” we are attending to the intonations of language. In other words, “silent” reading is not really silent. That’s why writers will often read their work aloud to revise—even though almost all their readers will not read it aloud. But I would argue that they still register sound in some way, internally. I will expand that idea in my new book, The Case for Slow Reading. Stay tuned. You argue for television as a legitimate source of writing topics. Why do you see television as an under-valued resource? I think schools see TV, the Internet, and video games as the enemy. And this makes some sense—studies show that many students spend way too much time with this media, often multitasking. But I believe that TV can teach dialogue, conflict, characterization, narrative, humor. The visual narratives can provide scaffolds, or cultural props, for students to use in their writing — if teachers let them. They can write parodies or alternative versions with their friends co-exiting with fictional characters — Darth Vadar and the kid down the street — all in the same adventure. I hesitate before opening this can of worms, since much of my livelihood depends upon the approval of gatekeepers (editors, teachers, librarians, bloggers, book purchasers) who are overwhelmingly female. Clearly, the world of children’s books is a woman’s world. Is that, in your opinion, part of the problem when it comes to boys literacy? One challenge is to look at books from the boy’s point of view. I don’t think gender is an absolute barrier here. What’s needed is an open mind, a sense of curiosity. What makes this boy tick? What are the themes, passions, competencies in his life that I can build on? To teach we all need to get outside ourselves, and into someone else’s skin. I know many female teachers who are wonderful at this. And it seems to me that when a boy senses a female teacher cares about what he cares about, that boy will be open to other things the teacher asks of him. Finally, can you recommend any other books on this topic? Thomas Newkirk is Professor of English at the University of New Hampshire. He has studied literacy learning at a variety of educational levels — from preschool to college. His book,Misreading Masculinity, was cited by Instructor Magazine as one of the most significant books for teachers in the past decade. He is also the author of Holding On to Good Ideas in a Time of Bad Ones: Six Literacy Ideas Worth Fighting For and The Performance of Self in Student Writing. 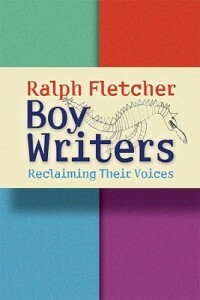 Readers, note: Please check out my other blog, FATHERS READ, for more on the subject of boys literacy. I’ll be away on school visits for most of the week. Thomas Newkirk is Professor of English at the University of New Hampshire. He has studied literacy learning at a variety of educational levels — from preschool to college. His book, Misreading Masculinity, was cited by Instructor Magazine as one of the most significant books for teachers in the past decade. He is also the author of Holding On to Good Ideas in a Time of Bad Ones: Six Literacy Ideas Worth Fighting For and The Performance of Self in Student Writing.